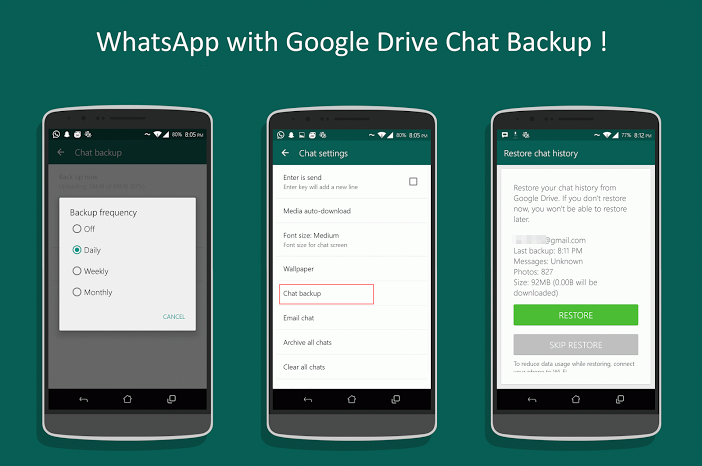 Download Update WhatsApp v2.12.45 supports Google Drive Backup Chat - The latest update to your loyal users WhatsApp. For those of you who love to change, change device, this new feature is very useful for you. Update official WhatsApp, with the new version: v2.12.45. In this version already supports Google Drive Backup Chat. So you will backup online. In this gapmod.com blog will be given a link mirror those of you who can not download in Playstore or official link. So you will be easier to download. WhatsApp call: Call your friends and family via WhatsApp for free, even if they are in another country. Calls via WhatsApp uses your phone's internet connection rather than your cell phone minutes package. More details you can read in Google play.